Turkeys aren't the only ones getting slaughtered this Thanksgiving - the week heading into the holiday has been a trying one for investors, with selling Monday and Tuesday dragging the S&P 500 back down to the lows set back in October during the worst month for stocks since 2011. A Morgan Stanley equity strategist got considerable attention amid the selling when he made the bold claim that we're in a bear market in a client note on Monday. But are we? Is the bull run investors have been enjoying since 2009 finally over? It certainly feels like a bear market in a lot of respects. Quantitatively, the fact is that the sort of selling we've seen in the last couple of months is rare in a bull market. In the last three-plus decades, there have only been three years when the S&P 500 has fallen 5% or more during October. One was this year. The other two were 1987 (thanks to Black Monday) and 2008 (during the Great Recession). In fact, if 2018 ended on Tuesday's close, this year would be the worst year for the stock market since the 2008. But that says a lot more about just how good investors have had it in recent years than how bad 2018 has been. Heading into Wednesday's trading session, the S&P 500 was down a little more than 1% year-to-date on a price basis (factoring in dividends, the S&P's total return was positive). As unpleasant as the recent selling has been, it's hard to imagine a scenario where a basically breakeven year for the broad market could be called a "bear market". At this point, the S&P is still holding onto higher lows in the long term - even just over the course of 2018, in fact. By definition, that's an uptrend. 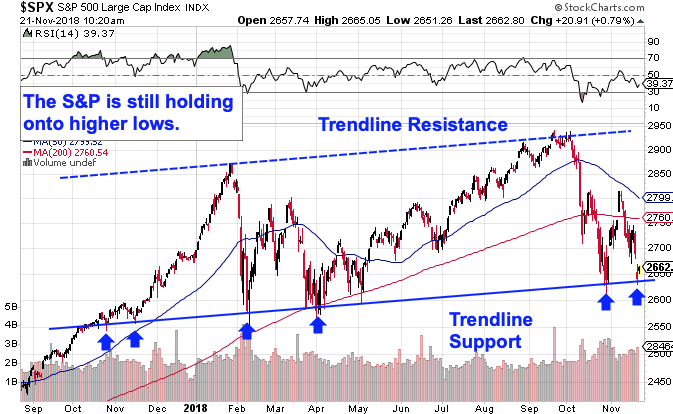 No, it hasn't been a particularly attractive uptrend; unlike the supremely low-volatility environment of 2017, this year's uptrend has been fraught with opportunities to do exactly the wrong thing at exactly the wrong time. Still, I have a hard time making the case that we're in a bear market for stocks when the trendline in the broad market is still pointing up and to the right. Observant market watchers will point out that around 40% of S&P components are now officially in "bear market territory," having backslid 20% or more from their highs. But that definition is completely arbitrary - and it doesn't take into account the fact that the broad market had given investors total returns of almost 35% from the start of 2017 into the highs this year. Most of the stocks that have corrected the hardest are the same ones that led the market higher during that stretch. Much ado has been made of Amazon's 23% drop since October started. But those same folks have ignored the fact that Amazon is still up 105% since the start of last year. Bigger rallies beget bigger corrections. They always have. The recent price action needs to be looked at in context. Even after the painful selling at the start of this week, the S&P 500 is higher than it's been any time in history up until 11 months ago. When 2018 rolled around, investors had largely forgotten that stocks can go down as well as up. When that happens, the hangover tends to be unpleasant. What we're seeing now is the pendulum swinging the other way, but it's still within the context of higher lows - for now anyway. It may be rare to see the sort of selling we got last month outside of a bear market, but it's just as important to acknowledge that the type of no-volatility uptrend investors experienced all year long was just as much of a statistical anomaly (heading into this February, the stock market hadn't seen a 1% single day decline in five months). Could we still end up entering a bear market in 2019? Sure. We could also be at new all-time highs in the S&P 500 a quarter from now. Ultimately, the one certainty in the stock market is that nothing's for certain. One of the biggest misconceptions about investing is that you need to predict the future to make money - you don't. It's hard enough to accurately call where we are today, let alone where stocks will be a year from now. Making that call (and positioning your portfolio appropriately) is the biggest part of the battle. And as of today, we're not in a bear market. That's something to be thankful for this Thanksgiving.